I'm back from my unintentional hiatus from blogging. An unanticipated move and medical issues filled much of my summer, and suddenly we are a month into the school year! Things have settled down now, and I hope to make a return to my semi-regular blogging. Thank you to all of you who have viewed my page and left comments, even in my absence. This is just a short post to show you the hall passes I created for my classroom this year. Unfortunately, I did not take step-by-step photos, but it was a simple project. I started with a small wooden plaque, which I painted to match my room. I used a paint pen to do the lettering, which was easier for me to control than a brush. Painting even letters with a paint brush is challenging for me. :) When that was all dry, I glued a long piece of ribbon to the back, forming the hanging loop at the top and the two long trails at the bottom. Finally, I painted clothespins, writing "Hall Pass" on one side and my name on the other, and clipped them on to the ribbons. Ta-da! 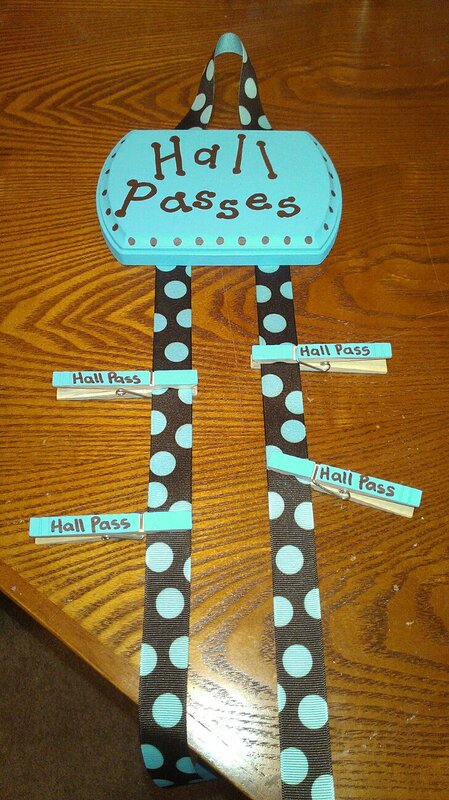 Cute hall passes! After a month of use I can say I'm loving these! My students can just clip one of these on their shirt when they leave for a restroom or water break. Probably my favorite thing about these is that, because they are clipped on, they are not being held with grimy hands or set down in a dirty bathroom and forgotten. One month of school, and my class of third graders have not lost a single one. But even if they did, it would be easy--and cheap--for me to replace, which can not be said for most custom hall passes. I also love that these can be customized with any colors, and, let's face it, they look pretty dang cute hanging up on the wall.